And breathe. 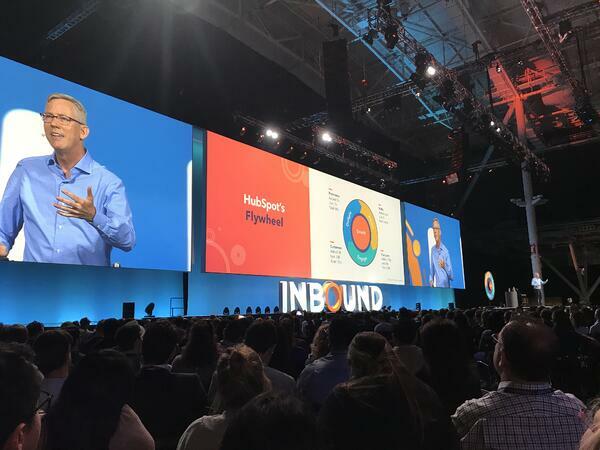 INBOUND 18 is officially in the books and amidst all of the brilliant keynote speeches and networking with fellow marketers (sandwiched between soaking in the Boston culture), HubSpot decided to throw a plethora of new products our way to round off an incredible week. Enterprise Growth Suite, HubSpot Video, the Standalone CMS, Marketing Hub Enterprise and even the formal introduction of the Flywheel got us all excited for the big changes and introductions for marketers to adapt to. However, sales teams can now finally rejoice and celebrate after they got some much-needed attention at INBOUND 18. HubSpot has officially unveiled the Sales Hub Enterprise - fitting under the Enterprise Growth Suite umbrella - and it features plenty of useful products and services targeted for sales teams. Why Has HubSpot HubSpot Created This Update? For the past few years, it seems as if everyone but sales teams have been able to take advantage of new releases and upgrades. This year, though, that seems to be changing. HubSpot has realised that modern sales teams clearly need more tools so that they can work more effectively and efficiently. By releasing the Sales Hub Enterprise update, HubSpot has shown that there’s a real importance on sales teams and how they work - so there’s no feeling of outgrowing the product. What is Sales Hub Enterprise? HubSpot’s new Sales HubSpot features a set of robust sales tools to help sales team reach that next level and become more sophisticated. The important thing to note about this brand-new update that HubSpot hasn’t just created this to manage deals or even their contact records more efficiently. They’ve taken it a step further. Sales Hub Enterprise has been designed to help sales teams improve their overall team communication, give them training on best practices, processes as well as visibility. Let’s move on to what’s actually featured in the new update. Before we get into the features of Sales Hub Enterprise and what makes it different from the next tier down - Professional - you should know that HubSpot hasn’t just improved an existing framework. In fact, it’s seen as a brand-new expansion so that sales teams can enter the Enterprise-level of working. One of the big differences you’ll notice right away is the number of users included in each tier. Sales Hub Enterprise now allows up to 10 users to start, as opposed to five in the Professional tier. Another difference is the price of both tiers. The professional tier costs £330 per month, while the new Sales Hub Enterprise costs £990 per month. Although, it’s easy to see why there’s a big price difference based on the features included. However, there are plenty of other features that are exclusive to Sales Hub Enterprise and aren’t available on any of the lower tiers. Call Transcription and Recording - Your sales team would not only be able to record all of the calls they’re in, but they can also get a transcription of it. Predictive Lead Scoring - This feature automatically scores and ranks leads based on their estimated likelihood to close. This is done by factoring in hundreds of different engagement signals and demographic factors. eSignature Options - Your sales teams can now digitally collect signatures for quotes and other important documents. Playbooks - Build a library of sales best practices and resources. Use rules-based automation to surface recommended content to sales teams right from your HubSpot account. Recurring Revenue Tracking - Your sales team can build detailed reports on recurring revenue and renewals. Calculated Properties - This update lets sales teams create fields in HubSpot that performs calculations and rolls up data from other fields, such as sales commissions and splits. 1:1 Video Creation - Sales teams can now create videos using their laptop camera or even the screen sharing tool inside their HubSpot account. This means they can share personalised videos with prospects directly from the HubSpot CRM and track their performances via a built-in analytics dashboard. The features don’t end there either. Although they’re not available right now, quote approvals, single sign-on and quota management are some of the features that will be available soon. Can keep more in touch with the new native Slack integration. Leverage the new HubSpot Conversations tool. Build a library of training materials. Caroline was more excited about the sales tools announcements in Boston than she was to have landed playing pool in a Southie dive bar. If you'd like her to explain them to you, book a call here. As you can tell everything HubSpot has launched in the Sales Hub Enterprise suggests that sales teams are no longer an afterthought when it comes to releasing new products for marketers to use. HubSpot has shown that they’re dedicated to putting time and effort into crafting innovate tools. The great thing is that these new robust features aren’t all about capturing leads and nurturing them to close, but they’re also making a serious effort into helping them improve through training capabilities. If anything, this is going to help take sales teams to the next level. Along with the new Sales Hub Enterprise, HubSpot also announced the latest product releases for the new Enterprise tier, the brand-new video features, Marketing Hub Enterprise as well as the standalone CMS. Check them all out and what else we got stuck into at INBOUND 18 by heading to our blog page. If you’d like to compare the HubSpot CMS to other big-hitters in the marketing world, click on the link below to see where HubSpot stacks up against the competition.